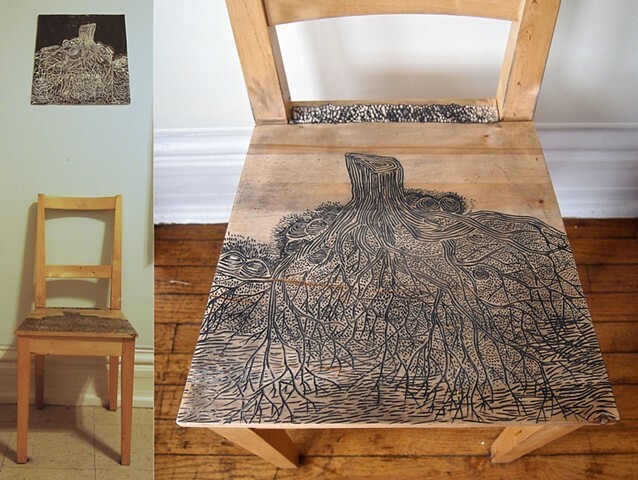 Rooted is woodcut print created using a chair and displayed with the original chair. Like a stitching thread sewing down time, life is built on the subtle variations. My artwork focuses on efforts to document the fleeing, but telling, details that often get lost. I work primarily with embroidery, printmaking, and drawing, creating series of small works as well as installations. My practice fluctuate between traditional two-dimensional work and more sculptural installation oriented projects.